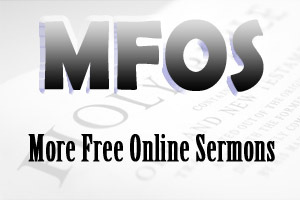 FREE DEVOTIONAL SERMONETTES provide some free sermonettes or free mini-sermons and explain how to write a sermonette. SERMONETTES or mini-sermons take discipline to write. Though a sermonette is shorter than a sermon; however, a sermonettes still needs structure - an introduction, a body and a conclusion. The content of a sermonette or mini-sermon is compressed in order to keep the deliver to five minutes or so. In a nutshell, introduce your sermonette subject, say a couple of things about it and then conclude your sermonette. Below are a couple of free devotional sermonettes. Rusty Welborn was a pitiful man. His childhood was a horror story. He was destitute, neglected, abused, and given no incentive to achieve in life. He was a street kid - a grubby, little street kid. Well, Rusty grew into an adult and found himself on death row for murder. Bob McAlister was a Christian and deputy chief of staff to South Carolina's governor. Bob had the opportunity to meet Rusty on death row and decided to show kindness to him. It took weeks for Rusty to respond to Bob's kindness and love. In time, Rusty became a Christian and sought God's forgiveness for his crimes and the forgiveness of those he wronged (Romans 10:9-13). On his final day, with only hours remaining before his 1:00am execution, Rusty asked Bob to read to him from the Bible. After an hour or so of listening, Rusty sat up and said, "You know, the only thing I ever wanted was a home. Now I am going to get one." Bob continued his reading and after a few minutes, Rusty grew very still. Thinking he had fallen to sleep, Bob placed a blanket over him and closed the Bible. As he turned to leave, he felt a strong compulsion to lean over and kiss Rusty on the forehead. A short time later, Rusty Welborn was executed for murder. A woman assisting Rusty in his last moments shared this postscript to his story. As he was being prepared for his death, Rusty looked at her and said, "What a shame that a man's gotta wait till his last night alive to be kissed and tucked in for the very first time." If only Christians would show kindness like that. Hurts would be healed. Lives would be changed, and God's people would make a difference (Ephesians 1:15-16). It was at a church service in Munich that Corrie Ten Boom saw him, the former S.S. man who had stood guard at the shower room door in the processing center at Ravensbruck. He was the first of her actual jailers that she had seen since that time. And suddenly it was all there - the roomful of mocking men, the heaps of clothing, Betsie's pain-blanched face. He came up to her as the church was emptying, beaming and bowing. "How grateful I am for your message Fraulein," he said. "To think that, as you say, Jesus Christ has washed my sins away!" His hand was thrust out to shake Corrie's. And Corrie, who had proclaimed so often the need to forgive, kept her hand at her side. Even as the angry, vengeful thoughts boiled through her mind, she saw the sin of them. Jesus Christ had died for this man; was she going to ask for more? "Lord Jesus," she prayed, "forgive me and help me to forgive him." Corrie tried to smile; she struggled to raise her hand. She could not. She felt nothing, not the slightest spark of warmth or charity. And so again, she breathed a silent prayer. "Jesus, I cannot forgive him, Give me your forgiveness." As Corrie took his hand the most incredible thing happened. From her shoulder along her arm and through her hand a current seemed to pass from her to him, while into her heart sprang a love for this stranger that almost overwhelmed her. And so Corrie Ten Boom discovered that it is not on our forgiveness any more than on our goodness that the world's healing hinges, but on Jesus Christ (The Hiding Place 1971, pp. 220 & 221). Nothing in this world could bring Corrie Ten Boom and that SS officer together except Jesus Christ. As the Bible says, "For Jesus Christ Himself is our peace" (Ephesians 2:14). When Jesus Christ died upon the cross for our sins, He destroyed the hostile barriers that divide in order to bring people to God and to bring people together. As the Bible says, "God's purpose was to create in Jesus one new man out of the two, thus making peace" (Ephesians 2:15). When we find peace in Jesus Christ, we will be at peace with others.